Home / News & Events / News / Need a Career Tracks Huddle? Subject: Need a Career Tracks Huddle? 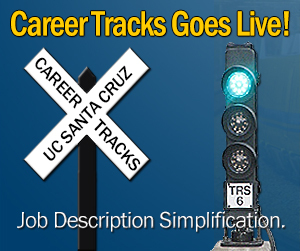 As we continue to work together to complete the launch of Career Tracks at UC Santa Cruz, we are pleased to offer additional "My Classification" Individual Employee Forums this week. These One on One meetings are individualized sessions for any employees who may need more context or support regarding how they were classified in Career Tracks once they know their Career Tracks classification. Covered topics could include opportunities for reconsideration, Q&A and discussion. Additional dates will be added as necessary. - Use this calendar to sign-up. Town Hall Events - How to use position description templates to support hiring and classification activities post-GO Live: templates, processes, support available.